The weeks before Christmas are all awash in shimmering celebrations and gatherings. It’s a big and joyful part of this chilly and cozy holiday season, one that creates warmth in our hearts and gets us into that beautiful mindset of giving and sharing. Many of us enjoy small office parties, small neighborhood get-togethers, or festive school gatherings that implore us to get creative and offer up one another something delicious to nibble on that’s both special and a little unique, and to warm our bellies and melt some of the ice crystals. 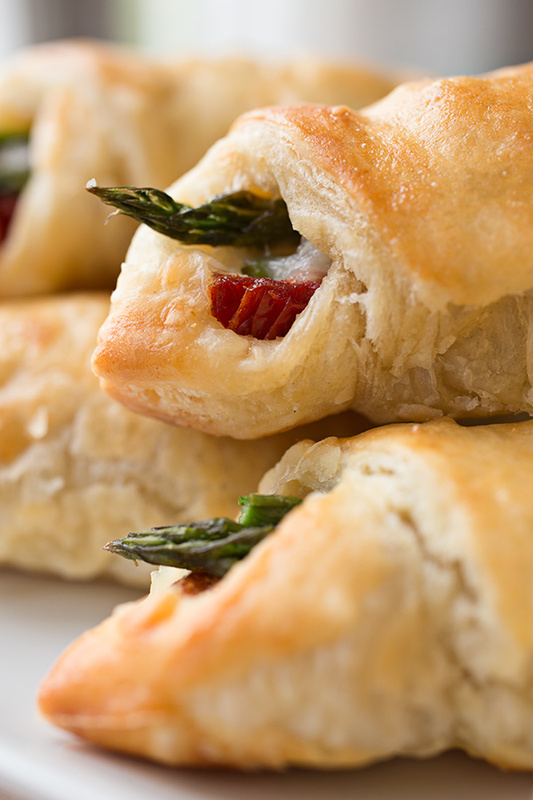 These are opportunities to share a little laughter, share a bit of our brightness, and fill ourselves with tasty little holiday-inspired finger-foods that are comforting and simple to create, and bring us together in more joyous ways. Sweet little cookies, cozy hot chocolate or cool eggnog, and tiny, minty candy canes are all little goodies that we typically love to enjoy and munch on; but savory and warming morsels are also the perfect holiday treats to offer up, especially the light, golden and flaky kinds that can comfort us so. 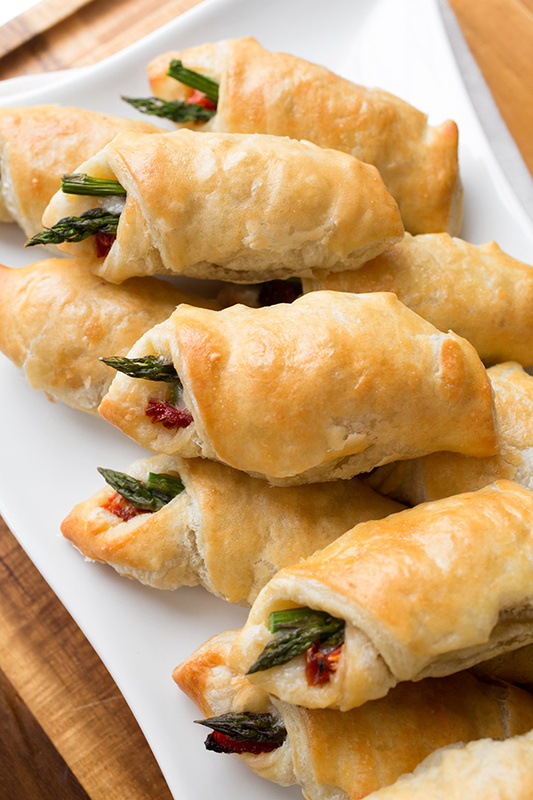 Prosciutto-Wrapped Asparagus Puffs bring a bit of holiday color and flavor to a festive gathering, and offer a little tasty bite of salty-savory in a sea of Christmas sweets. 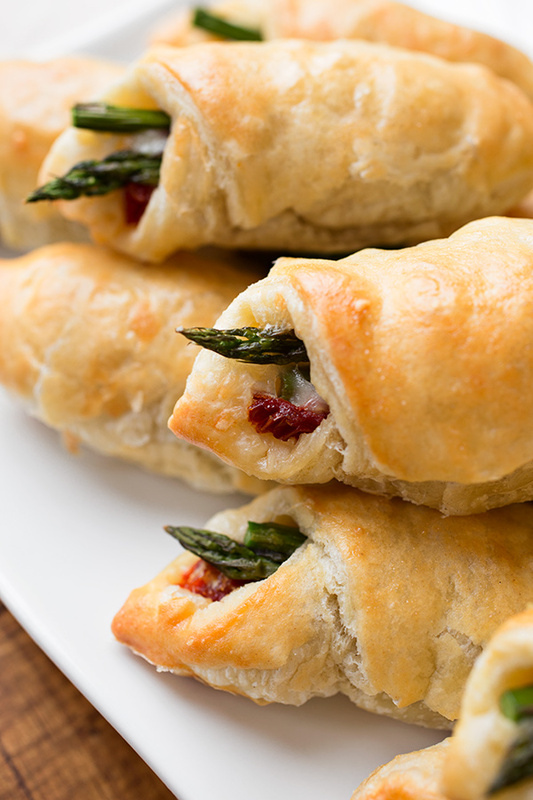 Light and airy, each bite has a little surprise within, a little pop of flavor from the salty prosciutto, the sweet sun-dried tomatoes, and the savory cheese; they’re the perfect little two-bite treats that’ll warm your tastebuds and get you into the spirit of things! So may your holiday gatherings be as bright and merry as the twinkling stars in the chilly winter skies; and may you and your loved ones be warmed by the precious little bites, those golden morsels, as you share together and connect with cheerful hearts and willing spirits. 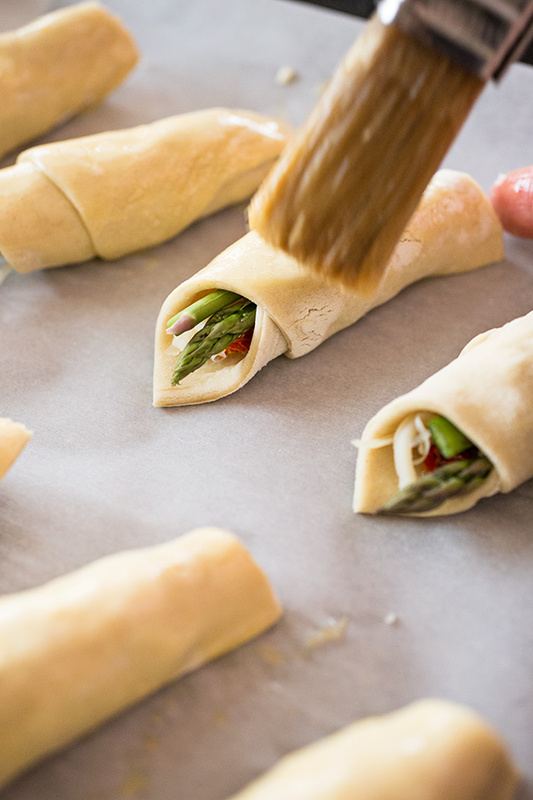 -Preheat the oven to 400°, and line two small baking sheets with parchment paper. 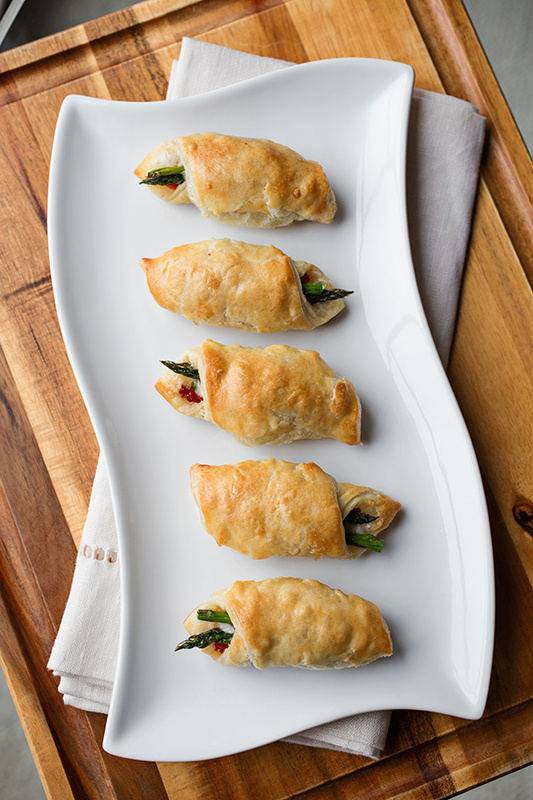 -Place one sheet of thawed puff pastry on a work surface in front of you (keep the other puff pastry sheet wrapped up and cold in the fridge), and roll out just a little bit to slightly thin out the dough. -Cut the sheet into thirds vertically, then into fourths horizontally making 12 pieces/squares. 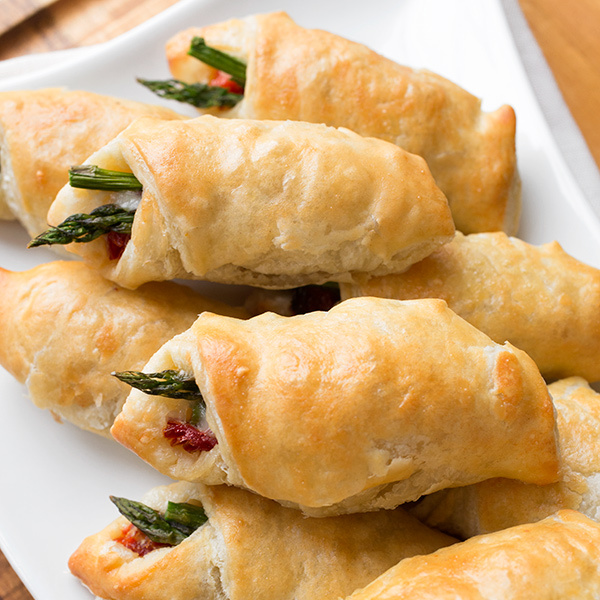 -Take two pieces of asparagus (a spear tip and a bottom half),and wrap them in a little piece of prosciutto; place a puff pastry square in front of you with a point towards you, and place the prosciutto-wrapped asparagus just above that point. 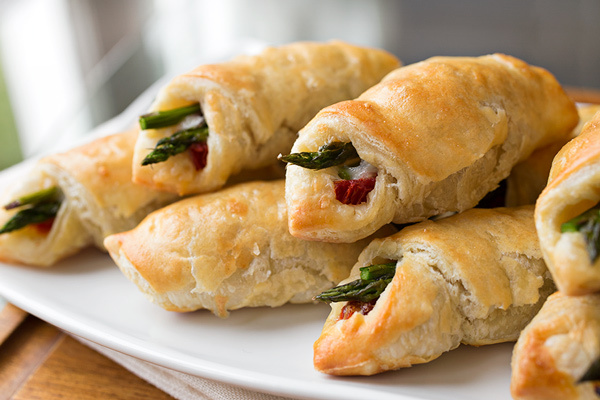 -Place a couple of pieces of julienned sun-dried tomatoes next to the asparagus, and sprinkle over a little of the cheese; then, fold the point over the filling and roll upwards finishing with a little egg wash to seal the seam closed; place onto one of the prepared baking sheets. -Repeat the process with the remaining 11 squares, then place the baking sheet into the fridge to keep cold while you repeat the process with the remaining sheet of puff pastry. -When both baking sheets are filled, brush a little of the egg wash over each of the puffs to create a golden color, and bake for 15 minutes. 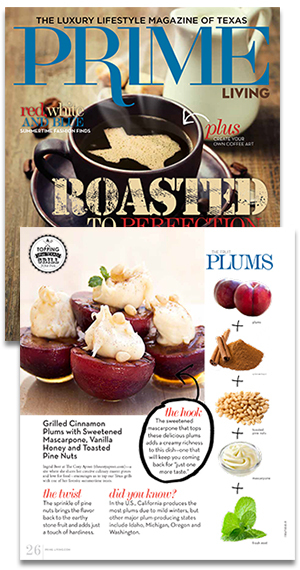 -Best served while hot and fresh, but you can serve them room temp, as well. These are so pretty! I’m betting they would disappear quickly at any holiday party! I’m always looking for appetizer ideas, and I’m pinning these to try soon! 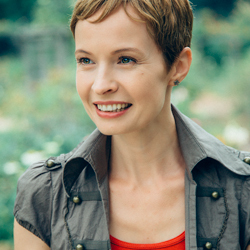 Hi Kristine, thanks for your comments! Hope you enjoy! These sound so good. Thank you. Hi! These look amazing. Can I make them a night ahead of time, freeze them, and bake the next day?! Hi Zaria, you can certainly make them ahead of time. I would just keep them well covered/wrapped with plastic in the fridge rather than in the freezer, and they should be just fine to bake the next day! Hope you enjoy. Love this recipe so much I shared it on my roundup today! Check it out!